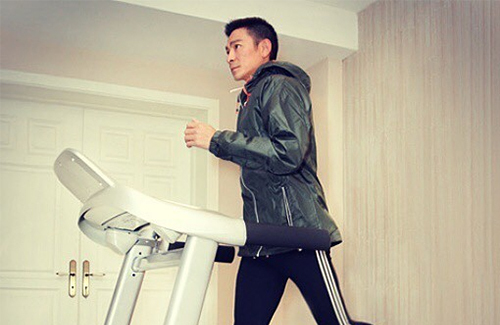 On September 27th, Andy Lau (劉德華) turned 57 years old. Growing up and maturing with his fans for nearly four decades, Andy has aged gracefully. Aging may be a natural process in life, but as long as we keep to the right lifestyle, the right diet, and the right mindset, the beauty of youth can be achieved. The keys to Andy’s youth, according to the actor, are diet and exercise. Andy tries to maintain his weight of 67 kg (147 lbs) by doing curls and stretches every single day. He has a regular routine of waking up at 8 a.m. and sleeping at 11 p.m.
Breakfast is always his heaviest meal of the day, and it comprises of grains and protein. Occasionally, Andy would include buttered toast, soy milk oatmeal, and fried eggs—with little salt—in his breakfasts. Andy’s lunches and dinners contain less calories. A typical lunch meal includes salad and boiled egg whites. His dinner consists of vegetables of all different colors. Andy is lactose intolerant, and drinks coffee without milk or sugar. Sources say black coffee reduces cardiovascular diseases and is a strong antioxidant, as it helps flush out toxins and harmful bacteria. It also helps improve blood circulation. Aside from black coffee, Andy also enjoys drinking organic juices, specifically his favorite blend of apples and carrots. Regardless of how hot the temperature is, Andy would avoid drinking cold drinks, as drinking chilled liquids restricts healthy digestion. Andy is a hard working man, and with the eyes of Asia on him, he has to keep himself looking presentable. I’m sure he sticks with a rigid diet and exercise. However, I thought that some years ago, someone named him as one of the idols who is aided with enhancers, namely for Andy, sheep cell injections, no?